Comcast and Netflix this week confirmed an agreement to incorporate Netflix’s streaming service into Comcast’s X1 video platform, signalling a dramatic shift in what has long been a contentious relationship between the companies. That’s a far cry from a few years ago when Netflix CEO Reed Hastings was working overtime to turn Comcast into public enemy number one in the net neutrality fight and Comcast was imposing interconnection fees on Netflix for access to its last-mile network. But the shift is more likely the result of a change in circumstances than a change of heart. What’s changed is that the focus of the regulatory fight over video delivery has shifted from net neutrality to set-top boxes. Netflix largely won its battle with Comcast on net neutrality. Although the Federal Communications Commission’s rules do not explicitly prohibit interconnection fees the agency asserted the authority to review interconnection arrangements under its new “general conduct” rule and the DC Court of Appeals recently upheld the commission’s assertion. In the meantime, the FCC has moved on to a proposal to “unlock” the pay-TV set-top box. FCC chairman Tom Wheeler wants to require pay-TV providers to disaggregate elements of their services to allow third-party device makers and app developers to build devices that can interoperate with pay-TV services while also integrating other, over-the-top programming sources and functionality. Fearful of losing control over the user interface to their services, pay-TV operators are pulling out all the stops to try to head off the FCC’s proposal, going so far as to offer a formal counter-proposal under which operators would be required to create HTML 5-based apps that could run on third-party devices, side-by-side with Netflix, Hulu, Amazon and other OTT apps, while preserving the operator-designed UI. The problem for Comcast is that neither solution would produce a great outcome. The FCC’s proposal would obviously be a disaster from Comcast’s perspective. But even the industry’s favored app approach could prove problematic depending on how it was implemented. Comcast is heavily invested, both financially and strategically, in its X1 platform and set-top box. It spent millions to design and develop the IP-based X1 platform (and its eventual successor X2), which Comcast views as a critical strategy to retain video subscribers in the face of cord-cutting and to introducing new, premium features that can sustain ARPU in an era of skinny bundles. That investment is the main reason Comcast has offered to license the platform to other cable operators as it seeks to recover some of those costs. In developing the platform, Comcast also made some critical design decisions to locate much of its core functionality in the X1 set-top, rather than a more cloud-based architecture that could be supported with a relatively lightweight client on the set-top. X1 relies on a lot of local processing. Comcast’s stated goal is to eventually move all of its subscribers to the X1 platform, and it recently backed off a plan to upgrade its legacy, non-X1 boxes in part because it might delay the shift to X1. Even more than its peers, in other words, Comcast is committed to its facilities-based video platform, and it’s been busily trying to persuade the FCC that implementing the platform on third-party devices is not feasible. In response to questions about integrating HTML5 with premium media extensions into the Commission’s proposal, we noted that the HTML5 standard does not describe how to work with a competitive user interface as envisioned by the FCC’s proposal. More specifically, HTML5 is an international open standard that was designed and deployed to enable a video distributor to create a service that is presented using the distributor’s user interface through its app, not a third party’s user interface. We also explained that HTML5 does not standardize interactions between the app and the video service backend. Rather, it standardizes the user interface elements of an app across different device platforms. HTML5 elements are used to present video and audio to the user, but communication between the app and backend servers is handled by code in the app in an idiosyncratic manner according to each MVPD’s and other distributor’s unique backend design. Comcast’s app program, in other words, isn’t so much a commitment to open standards as a hedge against something worse. The FCC is aware that TV systems can be either one-way or two-way and that modern systems use IP technology, the [FCC] official said. TV providers with IP-based systems can comply with the proposed rules by providing an API that allows third parties to request and receive video and related information according to the FCC. The API doesn’t need access to every feature in Comcast’s cable system—it just needs to know what a customer subscribes to and the other information required by the FCC’s proposed rules. 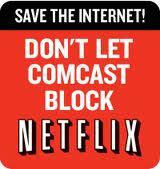 The deal with Netflix represents a doubling down by Comcast on its hedge against a worse outcome. It’s a bid to demonstrate to the FCC that it’s willing to co-exist with OTT services — even Netflix! — so long as it can do so on its own platform and its own terms. And those terms include protecting the investment it has in the X1 platform.